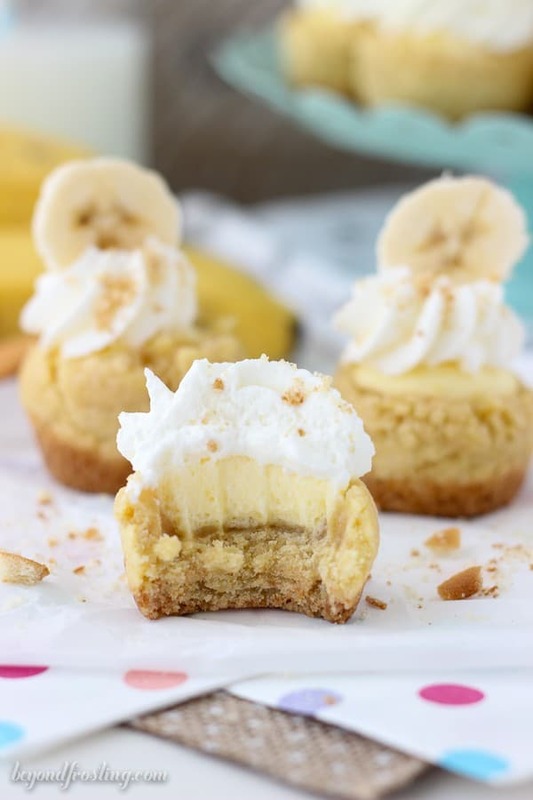 These irresistible Banana Cream Pie Cookie cups combine your favorite parts of banana cream pie but in a mini cookie cup instead of pie crust. We’re in major spring cleaning mode in my house. I’ve been going through ALL of my clothes, every cabinet in the kitchen, every inch of the garage and of course, all of my food props (but we’re not getting rid of any of those, let’s be real). On the one hand it feels great to get rid of bag after bag of stuff, and I’m lucky we have found a local live-in shelter that accepts donations. At least I know it will go to a good cause. However, it saddens me to see how much money I’ve wasted on clothes that I hardly ever wore. The next time I’m in H&M, remind me I don’t need the same shirt in every color they offer it in. Ay ay ay. Prior to dropping off a car load of stuff to the shelter, I invited a couple of girlfriends over and we decorated a few dozen cupcakes that I could take over there too. I am thankful to have found out that this same shelter takes pre-made food donations (something that most shelters do not), so every so often I bring them armfuls of desserts that I’ve made for the blog for which I can’t find a home for. 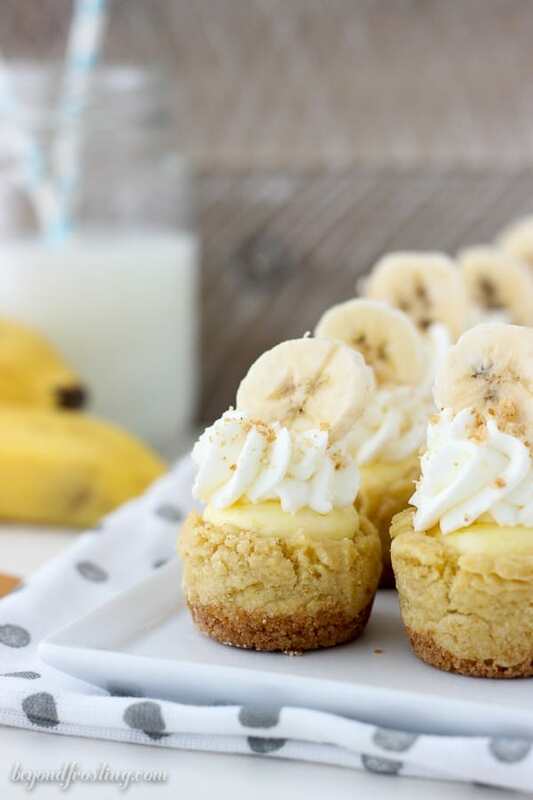 These Banana Cream Pie Cookie Cups were part of the dessert drop off over the weekend. While I would have loved to shove every last one of them in my mouth, it is not conducive to my waistline. So at last, they had to go. It was REALLY hard to resist these. The bottom is a Nilla Wafer crust. 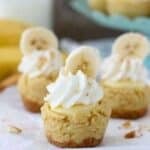 The next layer is a vanilla pudding cookie, although you could most certainly use banana pudding instead of vanilla pudding. Once these are baked, use a tart shaper and push it down gently in the middle to create a home for the filling. These cookies are slightly unbaked which helps keep the, extra soft despite being refrigerated. 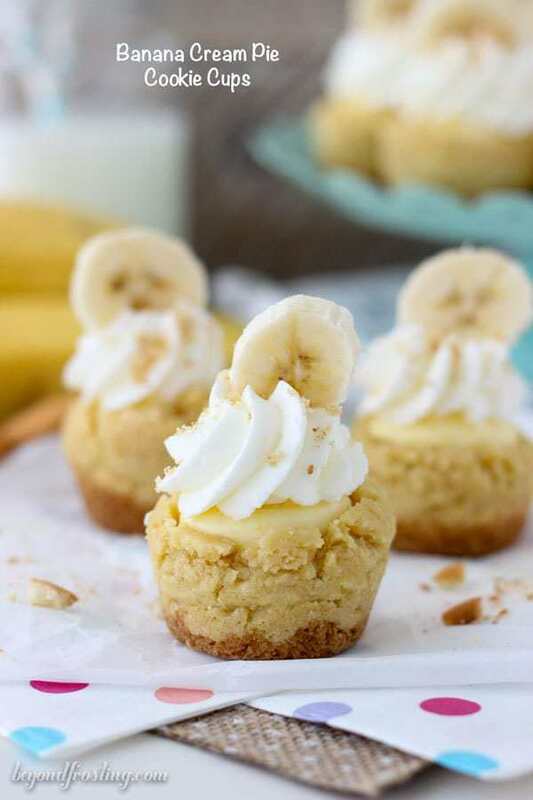 For the banana cream mousse filling, it’s quite easy. You can choose to use either Cool Whip or homemade whipped cream. 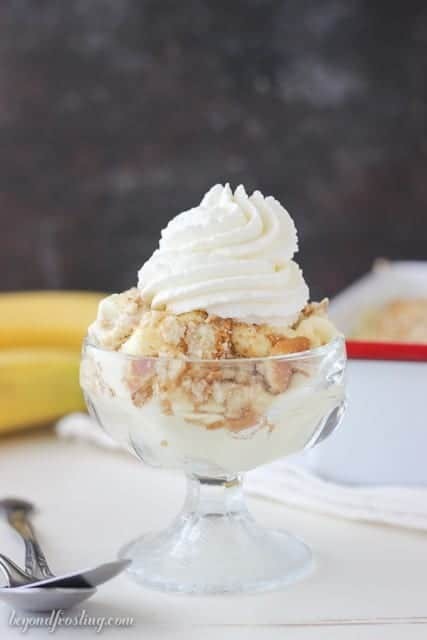 However, someone recently told me that Southern banana pudding is made with Cool Whip, but who am I to say. You’ll need a small box of instant banana pudding, some milk and the whipped cream. 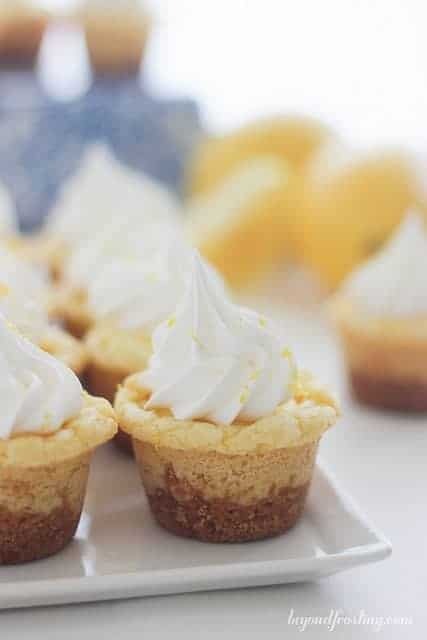 Once these cookie cups are filled with the mousse, top it with some more whipped cream. For the garnish, I choose fresh sliced bananas which I added right before serving. I also decided to add some Nilla Wafer crumbs just for fun. I am SO ready for another batch of these, that’s for sure. The one thing I mention in all of my cookie cup recipes is that I own a larger-than-normal mini cupcake pan. The one I own is from Calphalon. If you have a standard mini cupcake pan, I suggest to reduce the amount of cookie dough per each cookie. You will yield a larger batch. Use a food processor to grind Nilla Wafers into a fine crumb. Melt butter in a microwave-safe bowl until melted. Combine melted butter with Nilla wafer crumbs and stir until there are no dry crumbs lefts. Spoon 2 teaspoons of Nilla Wafers into the bottom of the mini muffin pan. Press down with a spoon or tart shaper. Allow butter to come to room temperature for about 30 minutes or microwave for 10 to 15 seconds. Combine butter and sugar in your stand mixer and beat on medium speed until light and fluffy. Add egg and vanilla extract. Beat into butter and sugar until thoroughly mixed. In a medium-sized bowl, combine flour, dry pudding mix, baking powder and salt. Stir to combine. Set aside. Slowly add dry ingredients into batter. If dough is a little dry, add 1 tablespoon of milk. Set dough aside. Drop 1-1.5 tablespoons of dough into the greased mini muffin pan on top of the Nilla Wafers. Bake at 350°F for 12-14 minutes. Remove cookies from oven and allow to cool for at least 5 minutes. Use a tart shaper or the back of a spoon to gently push down the middle of the cookies. Allow to cool completely in the pan. You may need to run a knife around the edge of the cookies to help release them from the pan. 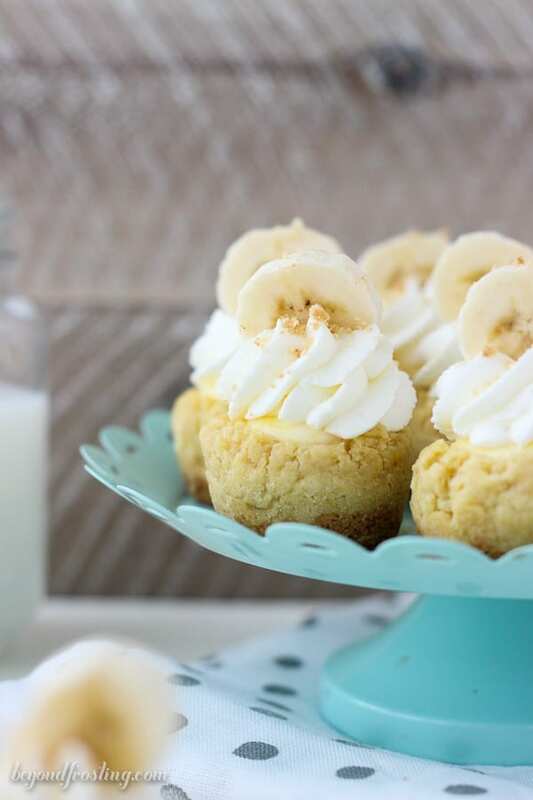 Combine instant banana pudding mix with milk. Whisk until powder dissolves. Refrigerate until the pudding is firm. Take 1 cup of the prepared whipped cream and fold it into pudding until mixed. Do not mix vigorously as it will deflate the whipped cream. Refrigerate the mousse until you are ready to assemble cookies. To assemble the cookies, put the mouse in a Ziploc bag. Cut the tip off the end of the bag and gently fill the middle of the cookie cup with mousse. Divide between cookie cups. 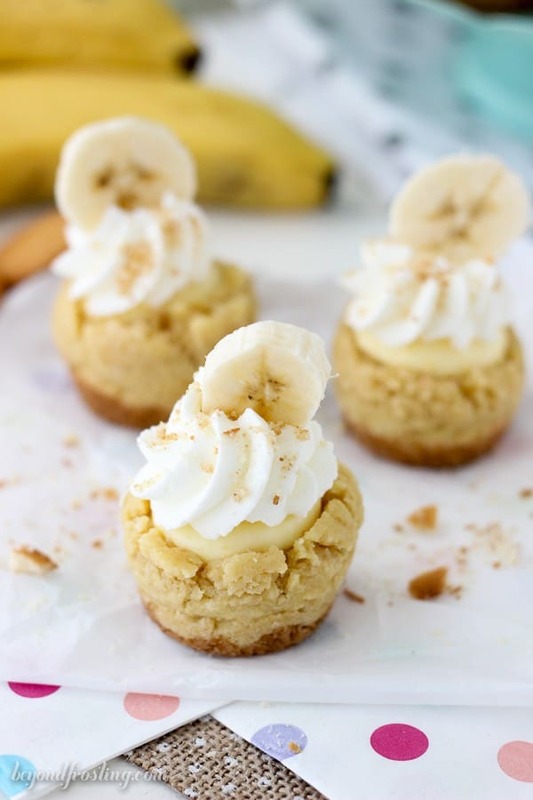 Top the mousse with a dollop of the leftover whipped cream and serve with a slice of fresh banana. I suggest to add the sliced bananas right before serving to prevent them from browning. I use a larger than standard size mini muffin pan. 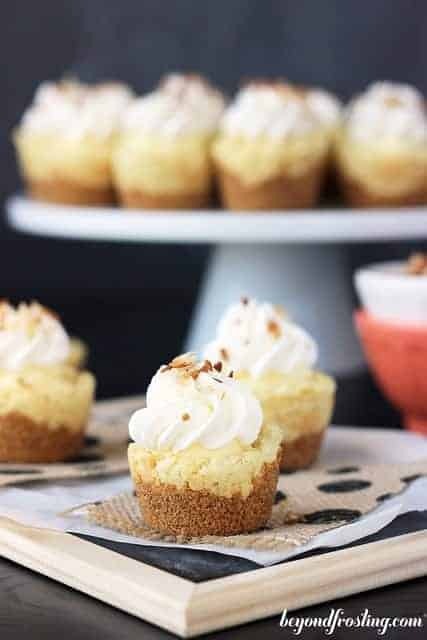 For a standard size mini muffin pan, use a little less graham cracker and a little less cookie dough. Hand held banana cream pie??? No way! Such a great idea and perfect for a party. I have been going through stuff too – it feels so good to clean things out and help other people in the process. I’m not sure if I’m missing something, but I’m confused with how many Nilla Wafers to use…do you use both Graham cracker crumbs and Nilla Wafers? Looks like a great recipe! Thanks!! Hi Erin, it should be 1 1/4 cups Nilla Wafer crumbs. Sorry for the confusion! I need a load of cloths I need to donate somewhere too! I like that these have a graham cracker crust and a cookie layer. Yum! 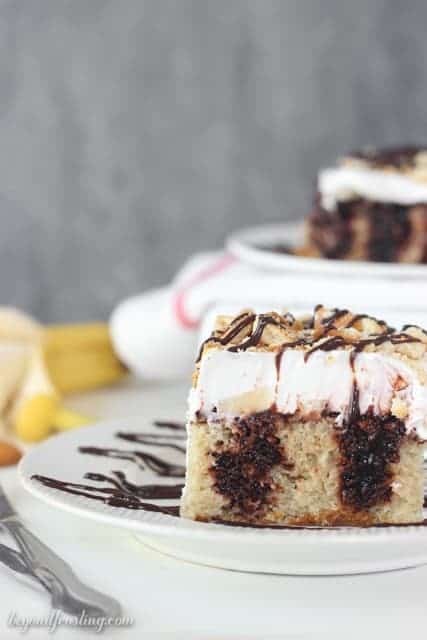 I love all the layers too! You have no mouse instructions. If using cool whip do you just mix in the pudding? Or do you need to add the powdered sugar and milk also? Hi Genie, thank you for calling my attention to that. There has been some weird formatting issues with my recipe card. All should be updated now. Have a great day! These looks delish!!!!! ~ Great idea about the shelter; I’m so glad they accept these donations! The bestselling book by Marie Kondo about de-cluttering I found under a pile of clothes over the weekend. Good for you and thanks for reminding me I have this goal. LOL! You crack me up! It is a nice way to brighten up someone’s day with some treats. I do a good closet clean-out every year or so and I always feel the same way. These look incredible — such a fun idea!! Thanks Kristan! It does feel good, but also wasteful! It’s a good reminder that we don’t need ALL the things!